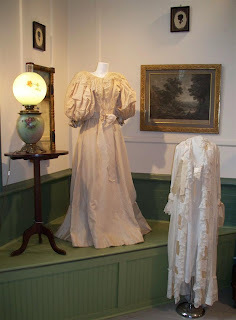 Weekend Historical Happenings: 9/22/12 - 9/23/12 ~ The History Girl! On Saturday, see over 100 antique and classic cars and trucks on display between 10:00 am and 2:00 pm. The Tuckerton Seaport is holding this event In conjunction with the Vintage Auto Museum of New Jersey. There will be judging and an awards ceremony. In case of rain, the event will be moved to Sunday, September 23. Admission: adults, $5; Children 6 to 12, $3; Children 5 and under, Free; Members, Free. The Tuckerton Seaport & Baymen's Museum is located at 120 West Main Street, Tuckerton, NJ. For more information call 609-296-8868 or visit www.TuckertonSeaport.org. Allaire Village Incorporated is hosting its Annual Fall Crafters Market. This is a fundraising event held Saturday from 10:00 a.m. to 4:00 p.m. on the grounds of the Historic Village at Allaire in Allaire State Park. Admission to the Crafters' Market is $2 per adult and children under 12 are admitted free. Exhibits by over 125 local craftspeople and artisans include demonstrations and feature everything from museum-quality pieces to country crafts and handicrafts. Many mediums of crafts will be represented and the crafters will be positioned along the village roads. There is a food and beverage service available, as well as a tree covered picnic area, which many be showing beautiful fall colors; a day of fun for the whole family. The rain date will be Sunday, September 23. This fund-raiser benefits the historic and educational programs presented at Historic Allaire Village by the non-profit organization, Allaire Village Inc. Patrons to the Crafters Market may visit the restored 1830's iron-manufacturing community now known as Historic Allaire Village. Authentically clad volunteer museum interpreters, artisans, and craft demonstrators including carpenters and blacksmiths, present the story of the historic buildings and of the people who lived and worked there over 175 years ago. The General Store/Museum Gift Shop and Bakery will be open for shopping and refreshments. Historic Allaire Village is located in Allaire State Park at 4263 Atlantic Avenue in Farmingdale, New Jersey 07727. For more information, contact the Allaire Village office during business hours, Monday through Friday, from 9 a.m. to 5 p.m. at 732-919-3500 or visit www.allairevillage.org. The militia is coming back! On Saturday from 10:00 am to 4:00 pm, Captain John Outwater's Company of the Bergen County Militia Regiment will return to Rockingham Historic Site for an encampment and trade fair. A member of the Brigade of the American Revolution and the Continental Line, this re-enactment unit participates in battle reenactments at many places in the former colonies, but it also provides insight into camp life, musket drilling and 18th-century family life as a whole. To portray Revolutionary-era camp life, members of Outwater's will pitch tents, display their gear, and cook on an open fire or charcoal burner. They will also oversee children's musket drills and demonstrate how muskets are fired. They will display medicinal herbs used in military life and demonstrate everyday crafts and skills used to repair and replace equipment, such as leather and woodworking. Rockingham, the last military headquarters of Gen. George Washington, will also be open for tours, along with its museum store. The event is free though free-will donations will be welcomed. For more information on Outwater's Militia, visit www.outwatersmilitia.org. Rockingham is located at 84 Laurel Avenue (Rte. 603) in Franklin Township, 1 mile north of Rte. 27 in Kingston, and 1 mile south of Rte. 518 in Rocky Hill. For further information, please call 609-683-7132 or go to www.rockingham.net. The public is invited to attend "From Modern School to Occupy," a program and lunch focusing on the history of the Ferrer Modern School and anarchist community in Piscataway and its connections to radical movements today. The archives of the school and community are held at Special Collections and University Archives, Rutgers University Libraries. The program will be held Saturday at the Faculty Dining Room of Brower Commons at Rugters University on College Avenue in New Brunswick from 11:00 a.m. to 3:30 p.m. Speakers include Barry Pateman of the Emma Goldman Papers at UC Berkeley, Jackie DeSalvo of Baruch College, and Thai Jones of Columbia University. For more information or to register, please contact Jon Thoreau Scott (jscott34@nycap.rr.com), Jeffrey Aaron (JAaronactivist@aol.com), or Ellen Rosner (rasheedaas@yahoo.com). A Revolutionary day of Living History at Griffith Morgan House will be even more revolutionary when combined with the annual Apple Festival at the Burrough-Dover House! A township-provided shuttle will carry visitors back and forth between the events to allow for a great day of history and fun! Both sites will be open from 11:00 am - 4:00 pm on Saturday. The Griffith Morgan House will feature Continental soldiers of the Revolutionary War drilling and firing their muskets, colonial cooking on the wonderful open hearth in the Griffith Morgan House, a cheese-making demonstration, a spinning demonstration, crafts and activities for the kids, refreshments, tours of the house and museum, and much more! The Burrough-Dover House will be open for the annual Apple Festival featuring live music, a spinning demonstration, kids' activities, Freedom Center for Wildlife with live animals, tours of the house and museum, and apple pie with ice cream! The Griffith Morgan House is located at 243 Griffith Morgan Lane, Pennsauken Township, NJ 08110. The Burrough-Dover House is located at 9201 Burrough - Dover Lane in Pennsauken. On Saturday and Sunday the Monmouth County Historical Association will host a Civil War reenactors encampment on the grounds of the Museum & Library, 70 Court Street, Freehold. The public will be welcome to tour the encampment between 10:00 am and 5:00 pm on Saturday and 10:00 am and 4:00 pm on Sunday. Tours of the current exhibition "Marching Away: Monmouth in the Civil War" will also be offered inside the museum. Organized by the 2nd Rhode Island Volunteer Infantry Company D reenactors group, the event will feature both military activities and demonstrations as well as craft demonstrations from the Civil War era. Ongoing activities will include: demonstrations of rug making, chair caning, hat box making and cooking over the open fire using recipes from the mid-nineteenth century. There will also be displays of toys of the period and of models of naval vessels used in the Civil War. Mary Todd Lincoln will be on hand to talk with visitors about her husband, President Lincoln, and about her experiences as First Lady. In addition, another reenactor group, the 6th New York Independence Battery, will be bringing a vintage 1863 Civil War cannon for display and giving demonstrations of how a cannon would have been loaded to fire. The exhibition, "Marching Away: Monmouth County in the Civil War," will be on view at the Historical Association through March 2013. Last year marked the 150th anniversary of the beginning of the Civil War and this timely exhibition explores how this conflict impacted the brave Monmouth County men who volunteered to join the Union Army. Admission to both the encampment and the museum exhibition is free. Parking will be available at the Monmouth County Courthouse parking lot. The Proprietary House Museum, located at 149 Kearny Avenue, Perth Amboy invites you to enjoy tea and cake with Philadelphia's most famous citizen. Barry Stevens will amuse and delight you during this presentation of Dr. Ben Franklin's life and his contributions. The price is $15.00 per person. Reservations are required. Please call 732-826-5527 and leave your name, phone number and number attending. Space is limited. The event is to take place on September 23, 2012 at 2 pm. As part of its "Historically Speaking" lecture series, Monmouth County Historical Association is pleased to welcome award-winning author Dr. David Martin to speak on Sunday at 2:00 pm. Dr. Martin will be presenting a lecture entitled "New Jersey Generals in the Civil War." The lecture will be held at the Court Street School at 140 Court Street at the corner of Rhea (parking lot entrance on Avenue A) and will be part of the association's activities during the Civil War Encampment weekend held at the Museum & Library grounds at 70 Court Street in Freehold. Dr. Martin is the author of over 25 books on the Civil War and American Revolution, including the award-winning Gettysburg July 1, A Molly Pitcher Sourcebook, and most recently, New Jersey at Gettysburg Guidebook. He is vice president of the New Jersey Civil War Heritage Association, sponsors of the state's Civil War Sesquicentennial Committee, and was a member of the state's Abraham Lincoln Bicentennial Commission. Dr. Martin is currently working on a book of biographies of New Jersey's generals and admirals in the Civil War, which is the basis for his talk for the Monmouth County Historical Association. The Court Street School is one of the principal structures associated with the segregated history of early 20th century education in Freehold. The original school was organized in 1915 in a one-room wooden building, exclusively for the education of African American children. The existing brick building was constructed in two phases in 1920 and 1926. All African American children in Freehold were educated here from kindergarten through 8th grade until WWII when it was used as an air raid shelter and ration station. It was reopened as an integrated school for kindergarten through 3rd grade in 1949, and closed in 1974. It became a community education and historical center in 1990 and was placed on the National Register of Historic Sites in 1995. Dr. Martin's lecture is open to the public and admission is free. Refreshments will be served. Please call 732-462-1466 for further information or to let the association know you will attend. The Court Street School is accessible to persons with disabilities. If there are any special needs that require accommodation, please contact the association at 732-462-1466 x16 within 24 hours of the presentation. Do you make the best cornbread in the county? Step up to the challenge at Historic Walnford's annual cornbread contest! Bring 2 batches of your prize worthy cornbread, along with a typed copy of the recipe, to Historic Walnford at 1:00 pm. Come view the new permanent display area at the Pascack Historical Society named "Spotlight on History," on Sunday between 1:00 and 4:00 pm at its museum, located at 19 Ridge Avenue, Park Ridge. The purpose of the new exhibit space is to allow visitors a close up, focused look at a few select artifacts every few months. The event is free, open to all ages and will run until November 15. This Sunday learn about woodworking tools and play a game of "What is it?" as you examine rarely seen artifacts. Free tours of the full museum will be conducted continually. For further information visit www.pascackhistoricalsociety.org or call 201-573-0307. Complimentary coffee and cookies will be served.